The new Prisonaires titles reveal an even wider range of vocal harmonies and musical abilities, influences and styles than the Sun recordings. The Prisonaires rock with ''Caldonia'' and ''Bony Moronie'', they sing sincere versions of ''Suppertime'' and ''Gentle Hands'', they reprise their best-known songs including ''Just Walkin' In The Rain'', and they make fun with ''The Boastin' Texan'' and other titles. 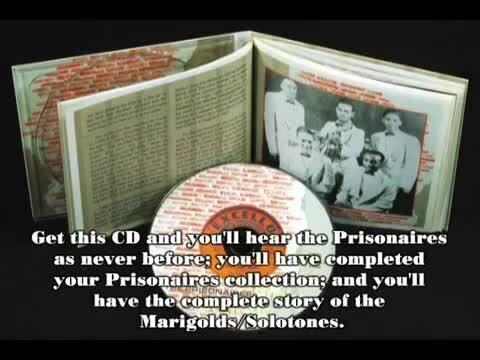 Get this CD and you'll hear The Prisonaires as never before; you'll have completed your Prisonaires collection; and you'll have the complete story of the Marigolds/Solotones. This CD is one of three discs telling the complete story of the Prisonaires and of their lead singer, Johnny Bragg. The early part of the tale has been told in our CD of Sun recordings, BCD 15523: The Prisonaires - ''Just Walkin' In The Rain''. This CD, ''Only Believe...'' tells the middle part of the story. Watch out later for our planned CD 'World Of Make Believe,' containing all the rare and unissued recordings by Johnny Bragg as a solo vocalist. An article in the local press in Nashville reads: ELVIS VISITS PRISON. En route home to Memphis after Wednesday's visit to the State Legislature, singer-actor Elvis Presley stopped for approximately 45 minutes at the State Prison. He toured the various workshops, dining hall, and death-house, and talked briefly with song-writer Johnny Bragg, who is doing time for a parole violation. "It was Elvis' idea to drive by the penitentiary", one of his traveling companions - buddy-guard - said. "He has known Bragg from back when he was starting out as an entertainer; scrounging for a living". Upon his re-release seven years later, Johnny Bragg formed Elbejay Records in partnership with Raymond Ligon and Cyril Jackson, and recorded three singles for them. By his account, he forgave Red Wortham for cheating the Prisonaires out of publishing royalties on "Just Walking In The Rain", and brought him in as Artist and Repertoire manager at Elbejay Records. more-or-less successful career in the music business. Before his death he became a contracted writer at Three Music and cranked out country-soul songs for Nashville-based labels such as Dial, Todd and Sound Stage Seven. The Prisonaires gained their moment of fame as a novelty act, but, as his music proves convincingly, their work transcends more novelty appeal. Johnny Bragg had a stilling lead tenor that ranks alongside that of his idol, Bill Kenny of the Inkspots. The music they cut for Sun Records was quite unlike anything else on the label - sophisticated and urbane, largely lacking the raw edge that Sam Phillips cherished. Certainly, there were some performances that missed the mark, but there's also "Just Walking In The Rain", a classic by any criterion. There is fierce pride in Johnny Bragg - evident in the way he spits out the world "Penitentiary". There is also darkness within him, which he laid aside to produce some hauntingly beautiful music.